Secondary antibodies recognize an antibody as their target antigen, usually referred to as the primary antibody which in turn is bound to its antigen or protein of interest. Unlike anti-idiotypic antibodies which bind specifically to the antigen-binding domain, secondary antibodies are specific to the conserved regions of an antibody which are constant within a particular class of antibody such as human IgG or mouse IgM. 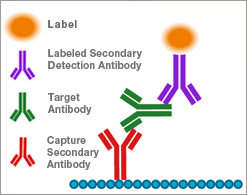 Secondary antibodies are therefore able to bind to ranges of antibody clones making them very effective research tools. Here we describe the applications of secondary antibodies and the considerations needed in their selection. Secondary antibodies are commonly used to detect and visualize the presence of a primary antibody in applications like western blotting or immunofluorescent histology. In these applications the secondary antibody is labeled with a reporter molecule, which may be an enzyme like HRP or a fluorophore such as FITC. 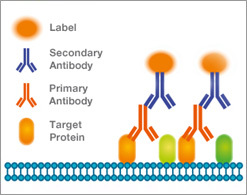 Multiple secondary antibodies can bind to a single primary antibody increasing the sensitivity and amplifying the signal. Further signal amplification can be achieved by using an unlabeled secondary and a labeled tertiary antibody if required. Read our reference guide for essential information on experimental design. Unlabeled secondary antibodies can be used to capture antibodies of interest from biological solutions by quantitative ELISA. For example, an unlabeled secondary mouse anti-human IgG may be used as the capture antibody to bind human IgG from a patient serum sample. This is then detected with a labeled secondary mouse anti-human IgG which binds to the captured IgG. The use of a calibration curve of known standards allows this signal to be quantified. Secondary antibodies can be used to detect and quantify recombinant proteins that have been engineered to contain antibody domains, for example for ease of expression, detection, stability or increased in vivo half-life. Read more about how secondary antibodies specifically targeted to the CH2 and CH3 domains of immunoglobulins enable the study of Fc fragments in the development of new therapeutic antibody fragments.